I am supposed to be finishing my book. I am so close, but I made a mistake today, I checked in on Amy's site and saw that I am in the middle of Spring Quilt festival time. 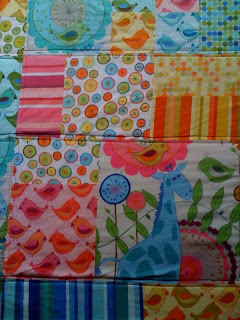 So instead of diligently writing, I am putting up my latest quilt for the show. I can't scrape the cat of it, or the child so don't be surprised at the extra organic features in the pics. The story behind this quilt? Its for my little Pickles, my heart's delight. There is another one I am doing for her that is ultra special and thats an entry for next year. But this one? It's a Valori Wells pattern, and its straight from her, one of her freebie patterns. I decided to do this because my gf who wanted to quilt and had never done it before wanted to give it a go, so i said I would to. So when I look at this quilt, I see hours and hours of laughing and mayhem spent with Lydia, as we ran around our favourite quilt shop like a pair of five year olds making way too much noise. 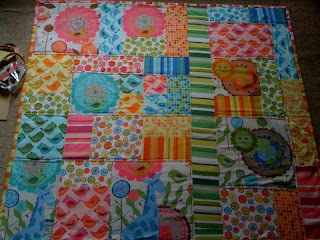 Its taken way to long to finish this quilt, Little Bow was done during this time and also a bunch of other stuff. As well as something bigger on the personal front. We have been having a major knock down, drag 'em out battle with our government about adopting our second child. Australia is the hardest country in the western world to adopt from, so its been a real nightmare. But as I was finishing up this telly cosy (Pickles calls quilts cosy's and that what quilts are called in our place), we finally where given word that we are going to be able to adopt an older child after months and months of frustration and heartache. I now have decided I had better get another telly cosy underway so this new addition to our family can have their own cosy, and I think if the weather is cold when we have to travel it will come with us to be given to it's new owner, who ever he or she is. 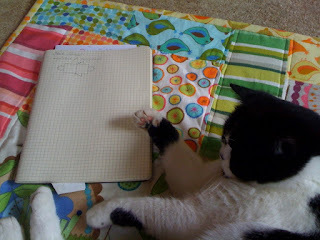 How come all sorts of life changing things happen when I quilt? Now a wee word on the block carrier, tomorrow night I'll post the rest of the instructions and some pics, or if I get a window and a chance to do some more work tonight I'll post then. Cute quilt, beautiful cat. Love Pickles. That is a fun quilt! Hmm ... life happens when you are making other plans, they say. great little quilt. 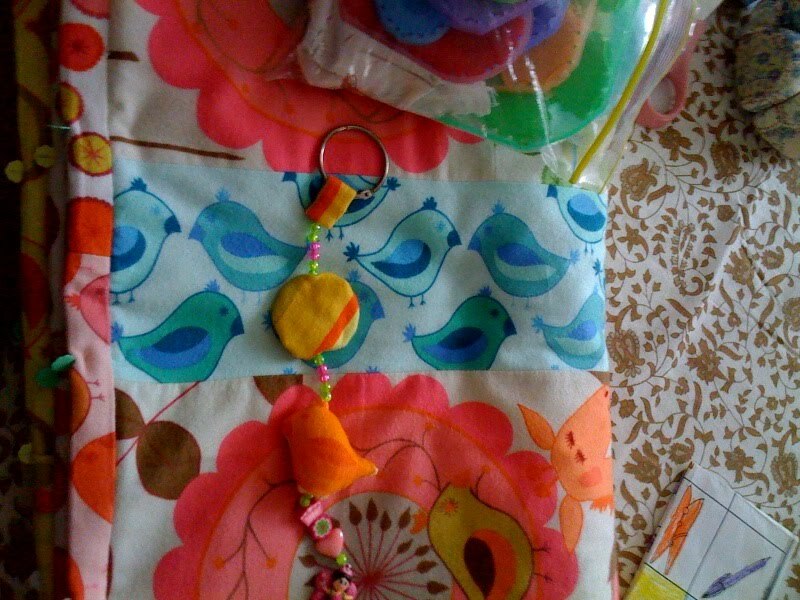 I really love the fabrics! Beautiful job! Love the fabrics you picked! cute quilt and wonderful materials!! congratulations on being able to adopt another child--blessings to all of you! Blessings to you as you welcome another family member very soon! I love this quilt; I actually downloaded the pattern, too, and your quilt makes me want to do one in this pattern right now!